Do you hear the whispers? 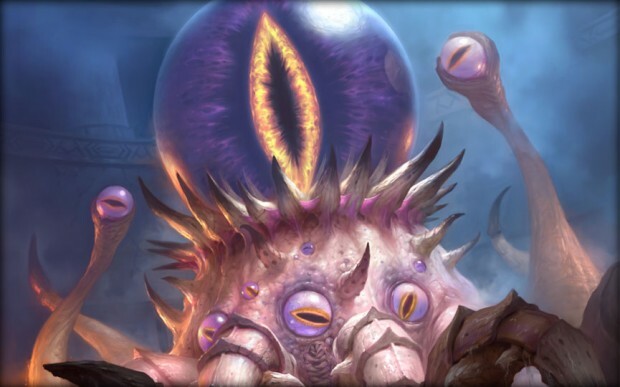 Millions of Hearthstone fans do now, as the newest expansion for Blizzard’s free-to-play CCG has just gone live in the Americas, bringing with it 134 new cards — and lots and lots of tentacles. Whispers of the Old Gods focuses on the four elder entities of the World of Warcraft mythos, each represented by a powerful legendary card. In addition, many old cards have been “revised” into newer, more sinister, versions. If you don’t want to wait to get in game to see them, you can view all the cards over on Hearthhead. Also present in the Old Gods release is the division of formats into Wild and Standard, Blizzard’s attempt to combat power creep and give new players a more even footing against players who have been in the game since day one. As a result, older card sets and adventures are no longer available for purchase, and the guaranteed packs in Arena runs always hand out a pack from the most recent expansion. You can also get a bunch of free packs just for logging in and completing a few basic quests during launch week. There’s an extensive list of changes and a card interaction FAQ over on the Hearthstone Reddit. When it comes to dealing with the old gods, knowledge is power — just not too much knowledge. They pushed the P2W aspects even further. Seems like a common trend from “ACTIVISION” Blizzard. Go play standard using limited amount of cards unless you buy the new packs from the new expansion. Then they push you to do it by offering your even more cards if you win 2 times, afterwards 7 times. It’s like how they forced us to preorder Overwatch to obtain Tracer for Heroes of the Storm. This company is really starting to annoy me. Wasn’t it supposed to release simultaneously for Europe, Asia and the Americas? Ugly looking boredom, shame on blizzshit new games, their moba is so ugly looking , like game from 1999 with unplayable controls also, thats why all good staff leaving them. Well then, take your non-1990 self someplace else ? FYI this ugly game is very active and highly successful.